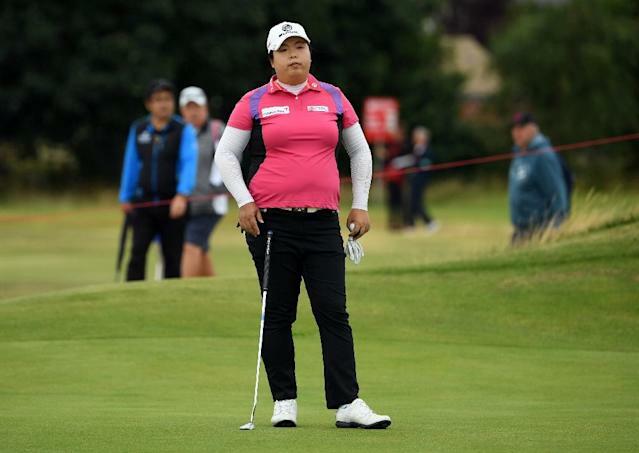 Taoyuan (Taiwan) (AFP) - A major sponsor expressed regret on Wednesday after China's Feng Shanshan and Liu Yu withdrew from this week's LPGA women's golf tournament in Taiwan, a move that will raise speculation that sport has again become a battleground between the two sides. The unexplained withdrawal of Feng, a former world number one, and rookie player Liu leaves the LPGA Taiwan Championship without any Chinese players and follows a rise in tensions between the self-ruled island and Beijing, which regards Taiwan as a renegade province. "It is a pity that they are not able to show up for the tournament," Johnson Wang, chairman of the Swinging Skirts Golf Foundation which sponsors the tournament, told Taiwan's state-owned CNA news agency. He did not elaborate on th e reasons for their sudden withdrawal from the event, which starts on Thursday at the Ta Shee Golf and Country Club in Taoyuan. Tensions between Beijing and Taipei have previously spilled into the sporting arena. In July, the Taiwanese city of Taichung lost the right to host the first East Asian Youth Games in 2019. Taiwan sports officials said the move was decided in a vote in Beijing. Taiwan's Chinese Taipei Olympic Committee said it believed the Games' axing was linked to Beijing's anger over a campaign by NGOs and some Taiwanese athletes for a referendum on whether the island should compete at the 2020 Tokyo Olympics as 'Taiwan', rather than the current formulation of 'Chinese Taipei'. Relations have deteriorated since President Tsai Ing-wen of Taiwan's independence-leaning Democratic Progressive Party took office two years ago, as her government refuses to recognise the island as a part of 'one China', the policy decreed by Beijing. Beijing has cut off official communication with Tsai's government. It has made a multi-pronged attack to erase the island from the international stage, including blocking it from global forums and poaching its dwindling number of official diplomatic allies. China is particularly sensitive to the island's use of names, emblems and flags as it sees them as an expression of Taiwanese sovereignty. It is under pressure from Beijing that Taiwan competes internationally as 'Chinese Taipei'. Huang Hsiao-fen, section chief for the International and Cross Straits Sports Division of Taiwan's Sports Administration, said the golfers' withdrawal was a "private matter". "We respect each individual's dec ision to attend or not to attend any international sporting event, regardless of the reason behind it because we consider that to be a private matter," Huang told AFP. Liu and Feng, the current world number nine, were among a number of Chinese players at last week's LPGA tournament in Shanghai, finishing tied ninth and tied 20th respectively.